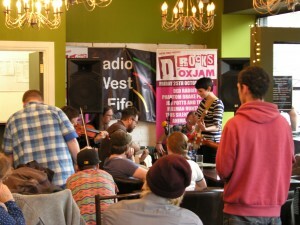 One of the main reasons My Voice Of Scotland was created is because of a love for live arts events. Now I do love all kinds of live events but, for me, music is a real passion and nothing excites me more than the chance to see and review new and upcoming bands and musicians. The charity Oxfam’s initiative to have a festival of local live music events across the UK offering folk a night of live bands for a fiver is a brilliant platform for local bands and musicians old and new to raise their profile while helping raise funds for the well known and respected charity. 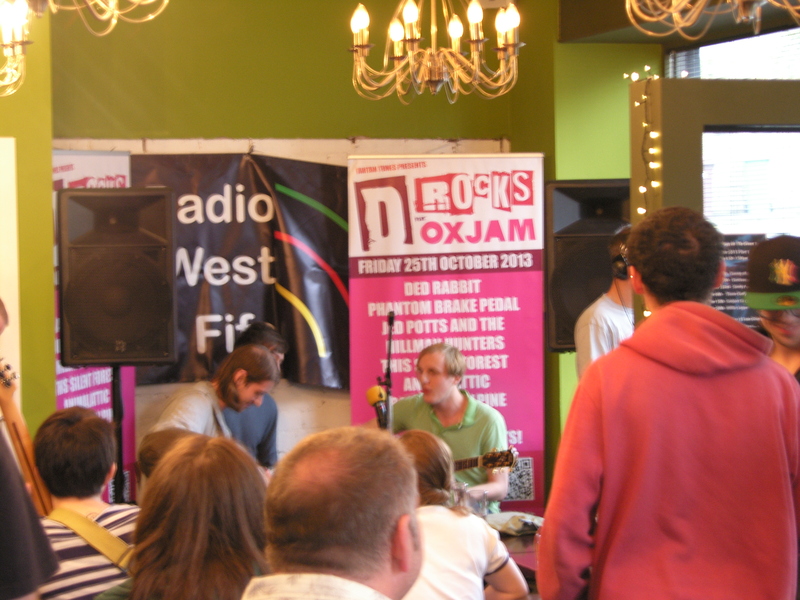 They named this delightful idea Oxjam, and in doing so created a feast of great bands and musicians for me and an army of like minded people up and down the country to enjoy. One such event locally to me takes place in Dunfermline’s P J Malloys on Friday the 25th October an event you should not miss. 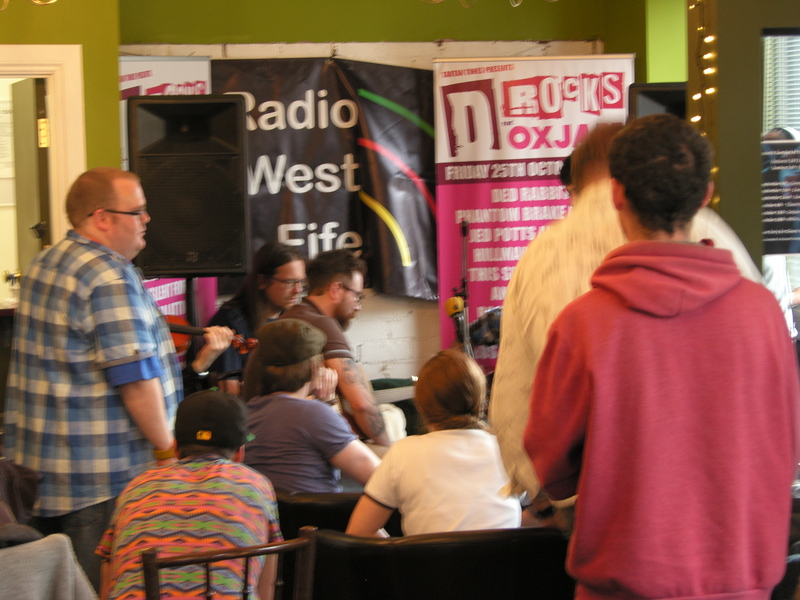 I stumbled upon this event recently via twitter when I followed @dunfoxjam, I quickly established that organiser Donald Makin of Radio West Fife intended having “a wee launch gig” in the towns The Green room Cafe bar on Sunday 6th October, and was delighted when he said I was welcome to come along and take a few pictures and do a review of the 2 hour launch event. First up in the comfortable confides of The Green room, kindly handed over to the organisers by bashful owner and chef Neil, was Dave McNeil a local solo musician who took to the stage with his guitar and got straight to it with his well carried, smooth voice paying us three excellent tracks including a superbly performed cover of Paolo Nutini’s Rewind. 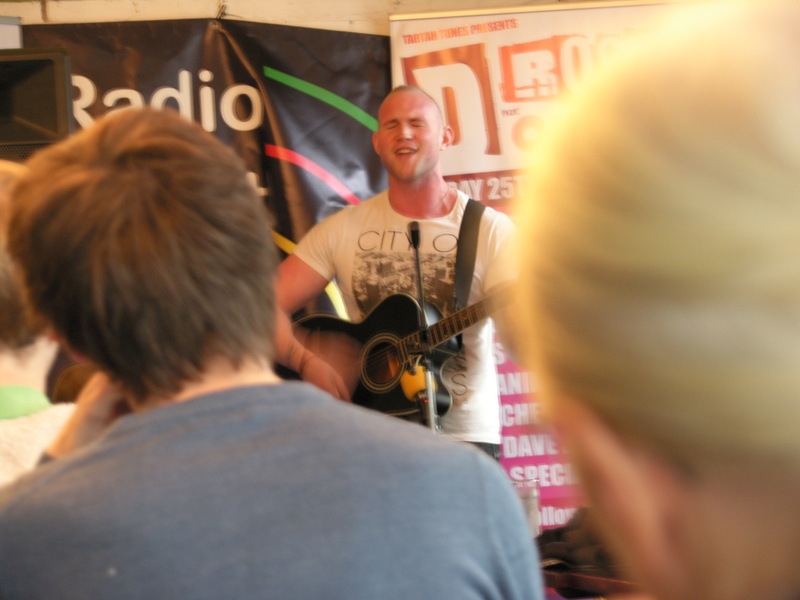 Dave’s acoustic set showed us he has a real passion for his art as he played the set out seamlessly to small audience of 18 and growing in an intimate venue which is a tall order for any musician. All in all Dave proved to be an articulate performer whose smooth tones proved to be a fitting start to the event. The next performer to take to the stage as The Green Room filled up and the coffee flowed was one half of duo Wolfmonkey who told us the other band member couldn’t be with us and that the missing Half of their act was the singer! “I’ll do my best” he told the growing audience of eager ears. And he sure delivered the goods Playing two acoustic tracks filling the room with his husky voice and perfectly demonstrating his skill as a guitarist. He even threw in some comedy with a wee joke between his tracks, perfect. If this was just half of what Wolfmonkey have to offer then I would love to hear the whole of this foot tapping good performance. 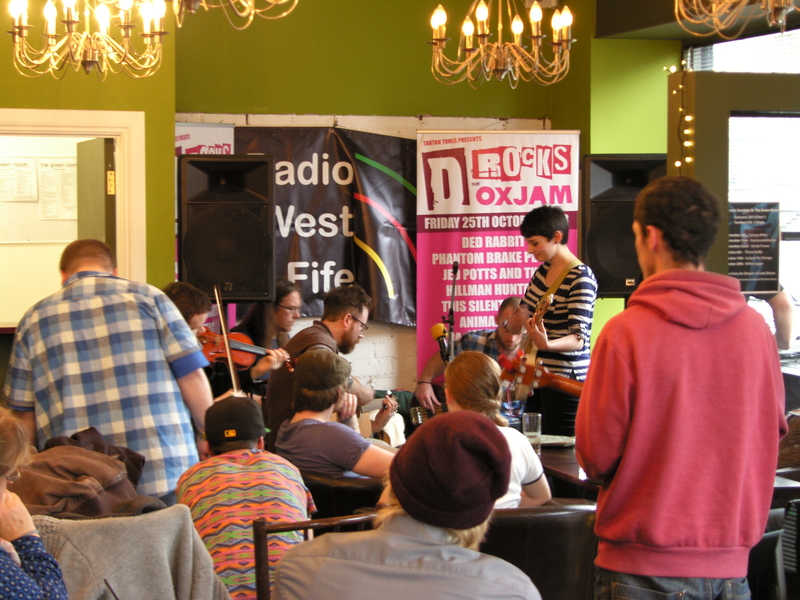 May have to go to the Glasgow oxjam for that treat though as they are playing there due to the bill for Dunfermline being full, sounds like a good excuse to get to another gig to me! After a short break and another round of coffee a band in their infancy having only been together for 2 months or so and with a preference for performing their own songs named Animalattic took the stage. Donald announced the fact their gig from the previous night had started at midnight and the lads had been up since 9am rehearsing and then straight here. I will admit to having my doubts at this stage even though these lads were clearly dedicated and enthusiastic. My doubts however were quickly dissolved at the discovery of my right foot tapping away to their first track, which I should point out I have never heard before as it was one of their own creations and a fabulous creation it is. The band continued by playing their gorgeous cover of the Bill Withers classic Ain’t No Sunshine followed up by another of their own well put together and equally fabulous creations called Un-noticed. These guys are good and young, two months together and wow. Look out people because Animalattic are coming. The fourth band to grace our ears were five piece indy / post-punk revival group Echo Arcadia who played a three track set which were all their own work. Three guitars, a fiddle and a drum were used by the band to create their superbly melodic coming together of instruments and voices. Heads bobbed and feet tapped around the room as the fab five moved through their set treating us to three tracks from their upcoming LP to be released on 14th January 2014 entitled Beauty In An Average Life. Just excellent, and the extra thrill of a wee preview from their album made these focused and extremely talented musicians the highlight of my afternoon. I look forward to getting my copy of their album in january! 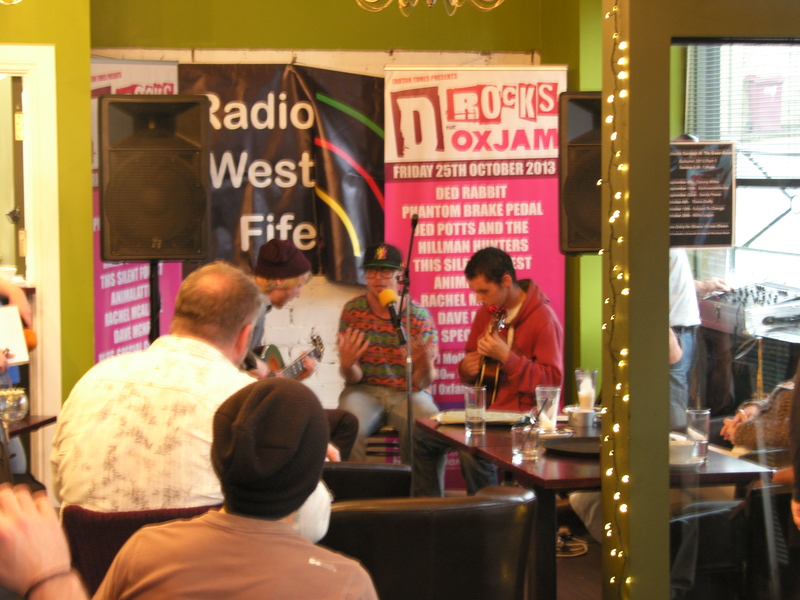 The Fifth and final act of the afternoon were three piece rap band Supa DaKryptonites . Now once again, faced with a young band who have been together for a mere 6 months, seeing one band member with a guitar and another with a ukulele or a little guitar and being told I was about to hear some rap left me with my doubts. Rappers with guitars does work though as the trio went right on and proved before my ears with a mixture of their original creations, a humorous rap entitled My Love For Nandos, and their cover of a capella classic Don’t Worry be happy by Bobby McFerrin done in their quirky reggae rap style. Supa DaKryptonites have released a 2 track single already and I have to say, in the end I found their superbly different beats quite irresistible! Now what more can I say, that was a fantastic afternoon sampling some cracking new musicians and that was only the launch, a small taster of the rapidly approaching main event at P J Malloys on the 25th of October where we will see a night with no less than seven live bands plus special guests gracing the stage. And, all that for just a fiver on the door. 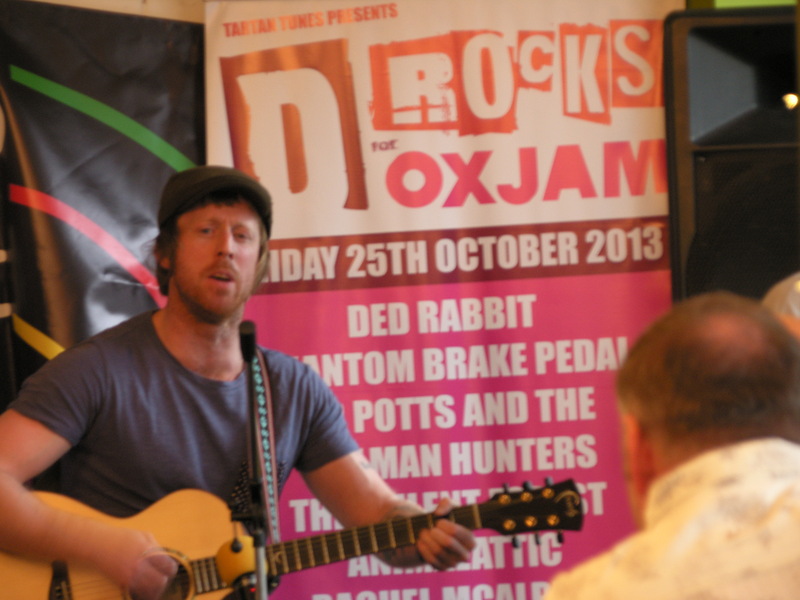 I take my hat off to Oxfam and their devoted volunteers up and down the country for enabling these Oxjam events to become a reality and not only helping themselves along the way but helping hundreds of unknown bands and musicians to gain local recognition which is the foundations of any successful career in live arts. If you cannot get along to the event at Dunfermline then fear not because there is one near you, just search for oxfam and follow the links on their pages. I think next year we may have voiceofscotland rocks for Oxjam. Big thankyou to all for involving us in this excellent project, see you at P J Malloys! 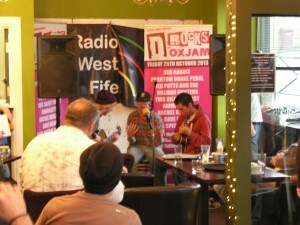 This entry was posted in Uncategorized and tagged oxfam, oxjam by my voice. Bookmark the permalink.